If you’re trying to sell your home, it can be tough to compete with similar properties in your area that have more features than your residence does. But even if you plan on keeping your current address, you still want to maximize your home’s practicality without spending a fortune. 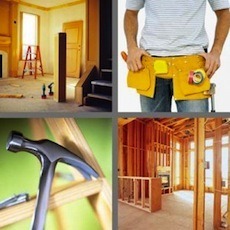 One solution for either problem is to remodel or renovate part of your home to make it more appealing and comfortable. But you also want to get a lot of bang for your buck. So if you want to improve your home and see a nice return on investment, here are the top five projects which you should consider. It’s the first thing that people will see walking into your home, so a new front door makes an excellent initial impression. The new entry door would be factory-finished and made of 20-gauge steel. The project also includes jambs, an aluminum threshold, exterior brick-mold, a new brass (or antique brass) bored-lock, and a clear dual-pane 1/2-glass panel. And with an average cost of about $1,240, it’s a nominal outlay of expenses to earn a 73% return on investment. If you don’t want to spend the money to add on to your home, you can still put in a bedroom by remodeling your attic space. In addition to redoing the wiring, plumbing, lighting, and air conditioning/heating to accommodate the occupant, you would install four new windows with a shed dormer, a five-by-seven bathroom with shower, a rail and baluster on the stairs, and closet space before finishing and insulating the walls and carpeting the floor. All for a nice ROI of 72.5%. A residence’s windows are among the first places that wear and tear becomes apparent in the home. You could replace the existing windows with double-hung insulated vinyl or wood units and match the existing exterior trim. Or use simulated-divided-lite windows which are insulated and low-energy, then finish the exterior with custom colored aluminum cladding and redo the interior with stained hardwood. Depending on you choice, the return on investment ranges from 64.1% to 69.1%. Transforming a dirty laundry and storage area into a comfortable entertainment area will enhance your home’s livability and market value. The main room can feature laminate flooring and a mixture of recessed and surface-mounted lighting fixtures. You can install a bathroom with shower as well as a full wet bar with storage cabinets, bar sink, refrigerator, and vinyl tile. After completing the rewiring and plumbing, insulating the exterior walls, and putting in drywall for the ceilings and walls, you’ll have a finished basement while pocketing a nice 66.8% return on investment. Chris Martin is a freelance writer who writes about topics ranging from auto insurance to consumer finance to home improvement. Wow. I didn’t think about installing a new entry door. Very good tips, thanks!